PACIV is an industrial automation company based in Puerto Rico. They were referred to us by another satisfied client. With over 35 pages of content, this is a very large site. We incorporated a lot of custom design elements, accentuated with many high-resolution photographs to really make the site very visually appealing. Due to the vast number of pages, we built a full width, drop-down sitemap. We also used top-level landing pages with icons and descriptions to enable visitors to easily find content. 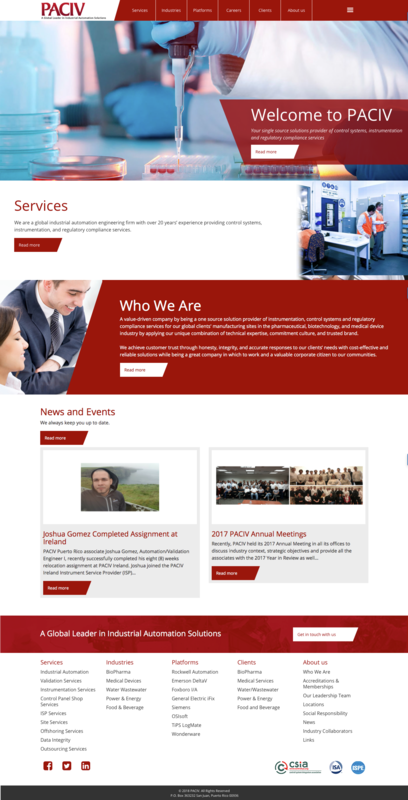 We are very proud of how this site turned, out, and the client was very satisfied. Thank you for your INCREDIBLE patience and your FANTASTIC customer service.